With the disparity in representation of women in the director’s chair and actor compensation, as Jennifer Lawrence penned in a recent letter, it’s no surprise that ArcLight Cinemas just presented an “Inaugural Women in Entertainment Summit” (WIE). Host Gretchen McCourt, Executive Vice President of ArcLight, can be said to be a driving force here, complete with a hashtag #arclightwomen. 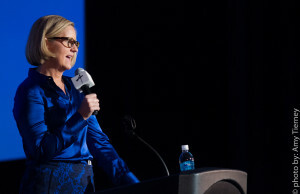 That said, on Thursday, Nov. 5, with 30 speakers in attendance, a reported 835 attendees descended on the Cinerama Hollywood Dome complex on Sunset Blvd. to power-network, hatch deals, and literally takeover the Men’s Rooms all over the venue. If you’ve never stood in the middle of a bunch of urinals and shared a bewildered laugh with 20 women tired of waiting in line at the Women’s Room, you’ve missed the analogy here. Luckily they did have closed-door stalls too.This impromptu Occupy Men’s Room moment underscored a general rallying cry for women in all aspects of filmed entertainment, above and below-the-line, in film, TV, Online, in Games, and as a demographic that makes up half of ticket buying audiences for theatrical releases. Just to debunk all three, with a stat not included in the Summit, for 2015, Jennifer Lee’s Frozen (Disney) entered the Top 10 money-makers at the box office. But Schulman is spot on when she mapped the “fall-out points” for women directors, from not enough network support, lack of funds, and various other obstacles unique to gender in Hollywood. “When money and stakes increase, opportunities decrease” for women, she noted. Geena Davis (Thelma and Louise), who created the Geena Davis Institute on Gender in Media, held forth on how it’s really going for women in film. 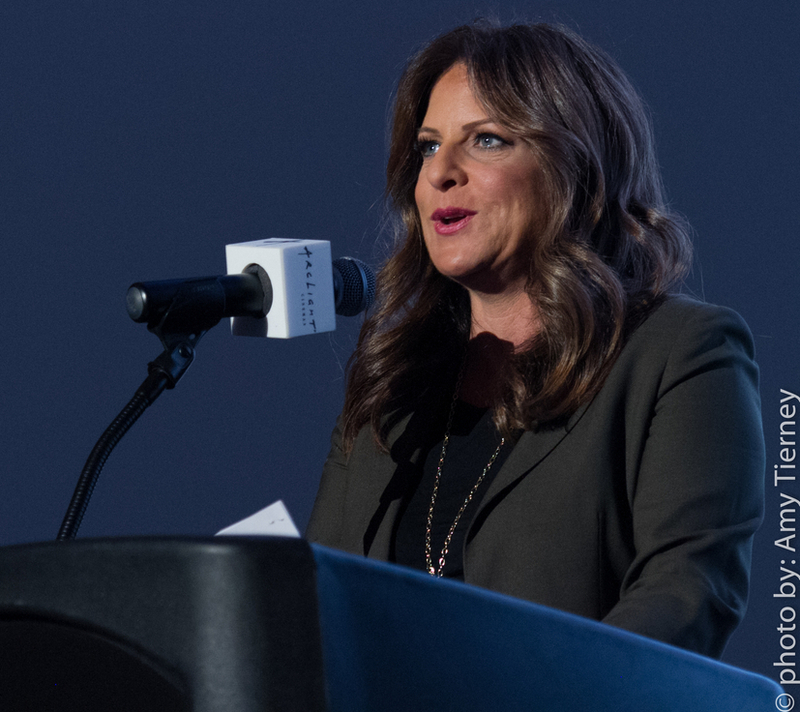 Gretchen McCourt, whose long history in the business includes tenure at AMC, made some time after the Summit to recap some key points and discuss scenarios for improvement. Here she is on the finer points of why this first Women in Entertainment Summit was established, and how the future will change as perceptions change. Were you the mastermind behind this event? One of the masterminds behind it. There were many masterminds behind it. It takes a village. What really happened with women filmmakers and women’s stories started about a year ago… Reese Witherspoon had produced and was starring in The Good Lie, and we were doing some special Q & A’s. Wild was just getting ready to come out, which was just amazing, that got me thinking, these great stories she was taking an interest in, and championing. I was also working with Lesley Chilcott on her documentary A Small Section of the World, (about women who run a boutique coffee mill), and WIF was involved in that project. We were doing Lesley’s Academy run. Ava DuVernay (director of Selma) was getting a ton of press. I started thinking, ‘We need to get behind this!’ What stories were being found and brought to the screen, written, produced and directed by women. And with Patricia Arquette’s speech at the academy awards — so it was really mid-summer — we got to this point were I was hearing all of these different stories, and ‘We need to get in the same room.’ That was our call to action. We started talking about it in July and just put our foot on the gas. Our goal was to have it happen before the end of the year. How did you get WIF’s Cathy Schulman and Geena Davis involved? So when we decided what we wanted to do, the first two calls we made were to WIF and the Geena Davis Institute on Gender in Media. Geena has been championing it for so long. We knew it couldn’t be successful without those two involved. And Geena was instrumental in getting the support that we got, as far as who showed up for the panels. What is the ArcLight doing to further the goals set by the Summit? We open our tenth ArcLight two weeks from now, in Santa Monica, and we will have something on screen at all times from a female director, female filmmaker or showing a female protagonists. So we’ve made commitments to having female films and filmmakers on screen, showing in our theaters, that is the starting point where ArcLight can step in. We’re already talking about some small series on first time female filmmakers, and a smaller summit in the Spring with female filmmakers. Because of some of the topics that came up at this event. We got a lot of feedback, and thought how do we create a tool chest for them? We’re putting together a group that sets up brands directly with the filmmakers, to answer how these filmmakers and creatives can find funders and mentors for their projects. 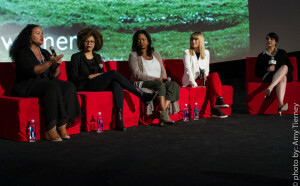 What were your takeaways from this first event for Women in Entertainment? Two things I think are so amazing. From Geena’s company, See Jane: “If they can’t see it, they can’t be it.” There are many roles behind or in front of the camera for women, but they have to see all of this variety for them to see that there can be a place for them. That and the stats from Cathy showing that a female filmmaker out of film school (or in general) has less chance of making a second film than a male has of making a second film than having made a movie that was a failure — her second film has less of chance than that, even if his first film was a failure. Also, in a typical crowd scene 17% in the background are female, versus in life over 50-51 percent! How about on a personal level? I took my daughter to see the Peanuts movie, and I found myself counting the girls in the scene. My daughter just turned eight, and for her to see herself in funny strong female characters on screen was great, and that was from (the late) Charles Schulz, for the 65th anniversary of the “Peanuts,” so he was very forward-thinking. Catherine Hardwicke told everyone in the room, “Go out and change the world,” to wrap up her panel. It felt like a rallying cry? It definitely was. “Go out and change the world,” is a good one. And “No effort is too small.” Meaning you don’t have to give millions of dollars or start foundation: there were 600 people in the room on Thursday. If all of those people are making female films a priority, starting a conversation, and sharing these films on social media, it makes a huge difference. There was a lot of inspiration going on, also the Men’s Room takedown, did you know about that? (Laughs) But there were a number of men there, which was great. One of the things we really wanted for the summit, and one of the goals we really set out to accomplish, was that the summit had to be positive, results oriented, and no effort is too small. This isn’t elitist, you don’t have to be an executive at a studio. No work is too small (that mantra) really came through, it came through from the panels, from the attendees, and I hope we get more male executives. We had Zack Snyder (Batman v Superman: Dawn of Justice, 300) there. He was there with his wife Deb Snyder (Batman v Superman, 300). One of the things she wants to explore even further is how women can work on their films. There are women doing (all kinds of jobs, below the line etc.) they are putting their money where their mouth is in terms of hiring. We also had panels on STEM, girls and coding (programming). Coca-cola has a fantastic program supporting girls in coding. It kind of felt like a revolution there, I have to say, with those stats from Cathy Schulman, and her slide on how to change things! She is such a great speaker — it is, it has to be (revolutionary). One of the things Geena brought up was, ‘oh it’s changed, then you look at the numbers,’ and we are not quite there. Cathy’s stats showed we have to move the needle, I think that’s what you were feeling. GENDER AND EQUALITY: Lack of equality has been at the center of media conversations in recent months. This panel will examine the challenges around the topics of gender, race, age and ethnicity and seek to find solutions that will change the game across all forms of entertainment. WHO RUNS THE WORLD? GIRLS! : Putting a spotlight on the next generation of girls and storytelling, we will discuss how to empower the female leaders of tomorrow and what tools they will need to break down gender barriers. SOCIAL CHANGE THROUGH STORYTELLING: A look at how documentary films focused on social issues affecting women can illuminate new perspectives and activate powerful emotions, which can awaken a desire to take action for a cause and promote change. LEVELING THE PLAYING FIELD: A discussion focused on how women are disrupting and building their own brands up against a male dominated media environment and changing the mindset that women’s sports are second tier. Leonard Armato, MPE, Amy Stanton, Stanton Company, Lenee Brekenridge, UFC Are We Telling the Right Story? 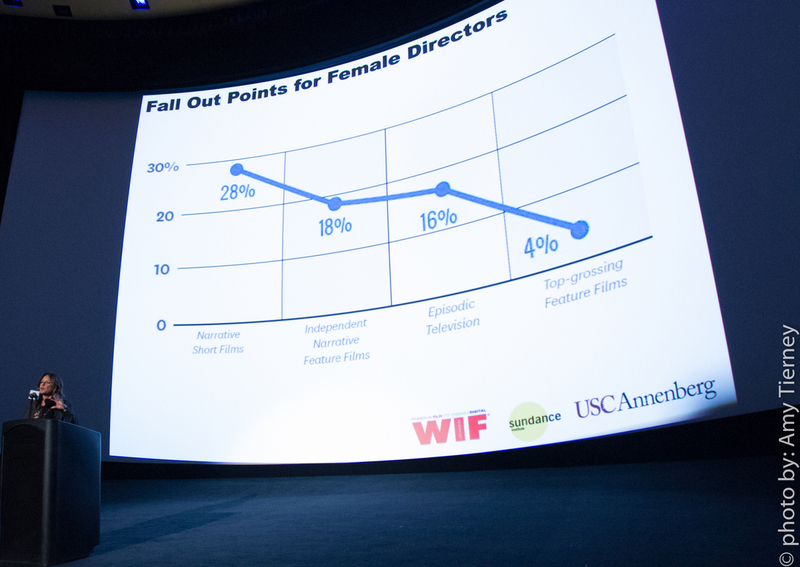 Media’s perspective on women in entertainment will be put under the microscope. Are media championing women or hurting the cause? A conversation focused on how digital platforms are changing the game for women in entertainment by creating new opportunities for female content creators to gain more ownership their own brands, content and distribution.